Thank you for your last paragraph. Indeed he never was a Nazi, neither ere his parents. The opposite is true. He forfeited his tuition fees because he did not attend the Hitler Jugend meetings and his family was not at all well off either. I’ve watched his Yad Veshem address. Beautiful and deeply moving. Can’t understand why a Pope should lambast the whole German nation, when thousands were in any case against the Nazis.Neither were all Christian in German Nazis. But this is what the Jews wanted to hear him say. Perhaps they should leave that to Angela Merkel who is the head of state of Germany. The Pope is not. That is exactly the point I was trying to get across. While it seems that many Jews were looking for stronger words from the Pope, I felt his speech was acceptable. I’m Jewish, if you couldn’t guess. Before everyone dismisses the pope, let’s get a few things straight. First of all, he was a member of the Hitler youth. Whether it was mandatory or not, he was, and as a result, it is fair game for us to grill him on that. Furthermore, it is the Vatican that has made this a bigger issue than it needs to be with all of its contradictions. One day they say he was NOT in the Hitler Youth, then, a few days later, they say he was forced. Furthermore, I am astonished that you are willing to disregard the nature of J. Ratzinger’s membership in the Hitler Youth. He was a MINOR, who claims to have been enlisted against his will. Can he really be criticized for being forced to join part of the Nazi propaganda machine? This is very different from becoming an SS soldier. I am not going to give the pope the benefit of the doubt, and to be honest, the Yad Vashem speech was the least of his faults. On a general note, since the dawn of the “war on terror,” the Catholic Church has acted cowardly. In addition, it has never sought any dialogue with the Jewish State, and the pope’s recent lift of the excommunication of a holocaust denier shows how much they could care less about their relations with the Jewish people. On top of that, the pope felt that it was acceptable for the Church to politicize his trip to Israel, by which he chose to back a “two state solution” (whatever that means) and totally condemn the Israeli government. It was inappropriate for the pope to criticize the Israeli government’s actions (taken in the name of the security of its own people) while standing in front of a SECURITY barrier in the Judea/Samaria region. The icing on the cake was when the pope said Israel should lift its embargo on the Gaza Strip. Folks, the Vatican could care less about the Jewish State. If we are going to seek dialogue and alliance with Christians, then we should listen to the Evangelicals (most of whom support the Jewish State unequivocally) and quit wasting our time with such a corrupt, cowardly organization. The Pope is a sovereign head of state. 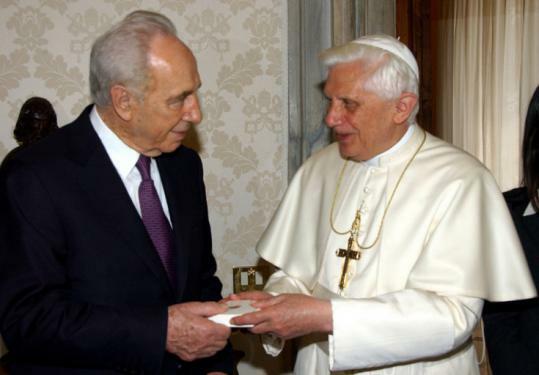 His trip to Israel was made in his capacity as head of the Vatican City. I am confused as to why you feel ‘politicization’ is inappropriate. The Vatican has its own agenda, just like any other regime. I agree that the reinstatement of some anti-semitic and Holocaust-denying elements of the Church was a big blunder. Let’s keep in mind that even the ADL ( http://www.adl.org/PresRele/VaticanJewish_96/44698_96.htm ) celebrated the Pope’s inauguration. One last thing–I think the support of Evangelicals for Israel is less about the state itself, or any strong Zionistic emotions on their part. They simply see the elimination of Muslims from Israel, and the restoration of all Jews to the Holy Land, as an integral step on the road to the Third Coming. They do not have the same goals as us and will certainly not act as the voices of moderation necessary to form a lasting peace in the Middle East.